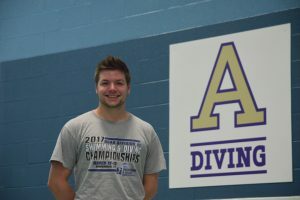 After graduating from Albion, Face coached diving at Albion High School for 23 years. Current Albion College assistant swim coach MaryAnn Egnatuk was instrumental in Face’s diving and coaching career. She also helped him receive recognition in the Albion College Athletic Hall of Fame. Face even coached against current Albion dive coach Eric Burris, Jake Burris’ father. Eric now plays a prime role in Jake’s diving career. In his time coaching against Eric, Face and Eric became friends, allowing him the opportunity to get to know Jake. 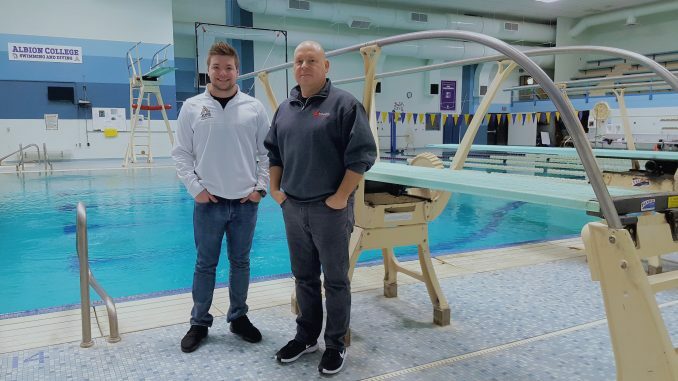 “There was a time in my first 10 years I even coached some kids that could have broken my record,” said Face, “Who better than Jake to break the record?” It requires a diver to vigorously practice technicality for greater performance. Diving requires an expertise on the approach, form and splash of the dive. The dives range in directions: forwards, reverses, backwards, twisters and inwards. The form of the dive could be in straight, pike or tuck depending on the flexibility and technique of the diver. A judge rates the diver on a scale from one to ten, with one being low and ten being perfection. During a swim meet, the pool deck should be silent during the diving section of the meet, allowing divers to concentrate on performing their technical event. Burris had multiple options to continue his diving career, including Division I schools. However, he gladly committed to Albion College. Burris entered Albion College with the Michigan High School Athletic Association Division II state champion Henry Swett. There was hope that either diver would break the record. “I wouldn’t say there was pressure to break it, like in the back of my head it [was] nice to break that record to have majority of the records,” said Burris. “Last year my back was pretty screwed up but good training over the summer helped me overcome that, where I could put myself in the best position to break that record this year,” said Burris. Jake Burris’ stellar performance gave him the opportunity to compete at the NCAA Division III national meet for the fourth time, in Greensboro, North Carolina. He placed fifth for the 1-meter competition with a score of 480.75 and seventh in the 3-meter competition with a score of 516.75. He finishes the competitive meet with two All-American titles. Burris also finished as the MIAA Men’s Most Valuable Diver for the fourth time and MIAA 1-meter champion and 3-meter runner-up during the 2018-2019 year season.